AND onto the new Tone Deaf mix tape with The Darkness and King Gizzard. How about them apples. SEPT | Thurs 27 | Indi Bar | Perth, W.A. SEPT | Fri 28 | Settlers Tavern | Perth, W.A. SEPT | Sat 29 | Prince of Wales Hotel | Bunbury, W.A. On the weekend before last we cruised down king street. 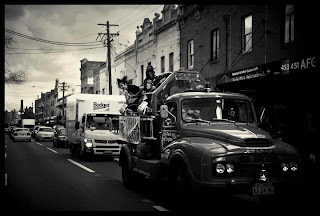 LOOSE sticky live gig on the back of a fire truck, with booze, car bombing, last minute changes and all round chaos. It almost didn’t happen which is a long story, won’t go into here, a few other bits of typical stickiness but in the end it was a blast, easily one of the funnest gigs we've ever done. There’s more footage on the net which we'll link you up to later.